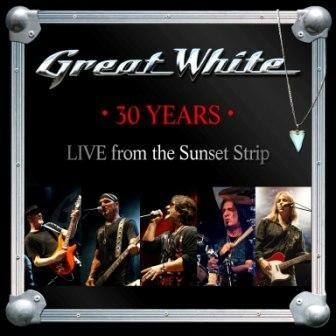 Great White returned to the Key Club on Sunset Strip. Great White were certainly one of the classier bands to emerge from the Los Angeles scene in the eighties, their brand of Blues-driven Hard Rock a far cry from the more sleaze-oriented material most of their counterparts were peddling at the time. To mark their 30th Anniversary they returned to the Key Club on Sunset Strip in March 2012 for a show and luckily had the foresight to record it for prosperity. It’s a shame that original vocalist and founding member Jack Russell is unable to be part of the band anymore, but I don’t want to get into the whys and wherefores of that particular argument here. Suffice to say, replacing him with XYZ frontman Terry Ilous was a masterstroke and I enthused about their comeback album ‘Elation’ in Fireworks #52 last year. But would Ilous be able to handle the band’s back catalogue as well as his predecessor? Well, yes of course, occasionally injecting his own style into the mix, but staying faithful to how the songs were originally conceived, whilst repeatedly informing the crowd just how much he loves Los Angeles. This anniversary show was recorded before ‘Elation’ hit the shelves, so there are no songs from that album featured in the set. Instead there are eleven tracks and seventy-plus minutes that, ‘Back To The Rhythm’ aside, delves into the bands ‘classic’ period with an excellent selection of hits and choice album cuts – and it’s amazing when you think how many of their fan –favourites like ‘All Over Now’, ‘Old Rose Motel’ and ‘Call It Rock ’N’ Roll’ don’t make the set. ‘Desert Moon’ kicks things off in style, before heading back in time for ‘Lady Red Light’. The lengthy ‘Face The Day’ follows, before they slow things down with the bluesy ‘House Of Broken Love’ and classic ballad ‘Save Your Love’ which Ilous delivers perfectly and soulfully. The raunchy ‘Mista Bone’ is preceded by a Blues interlude from Ilous and guitarist Mark Kendall; then it’s one of my favourites in ‘Big Goodbye.’ The amazing ‘Rock Me’ brings the set to a close and the encore features a ten minute version of ‘Can’t Shake It’ with an extended solo from Kendall as well as the rollicking cover of ‘Once Bitten, Twice Shy’ that the band made their own back in the late eighties. On the subject of Kendall, he is an amazing guitarist who probably hasn’t had the recognition he deserves and there’s some great interplay between himself and rhythm guitarist Michael Lardie. There’s talk of another new studio album later this year, until then this great live recording will do very nicely thank-you. Now how about some shows this side of the water guys?